Maresa skiing. Photo by Abigail Newby-Kew. Maresa Jenson joined Trustees as a legal fellow in September. 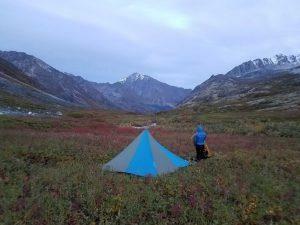 Here she writes about her journey to Alaska and her love of the wild, fish and mountains. I always felt drawn to the mountains. My parents instilled in me a strong sense of place in my hometown in northwestern Montana where I developed a love of the outdoors early on. As a family, we went on summer camping trips in the Bob Marshall Wilderness, and my father’s career as a potter gave him the flexibility to take me skiing frequently. In Whitefish, Montana, the sleepy mountain town where I grew up, I watched development projects jeopardize the places I adored as a child. These experiences and observations sparked my interest in environmental conservation and advocacy. Maresa fly fishing. Photo by Justin Mages. I am fortunate to live in Alaska now, a place with amazing mountains and exceptional recreation opportunities. How I ended up here was a calculated decision—I visited once, constantly contemplated moving here, and finally returned. My journey here started during a period when I was immersed in the ebb and flow of seasonal work in Montana and Utah, managing a restaurant at a ski resort and working for a community foundation. 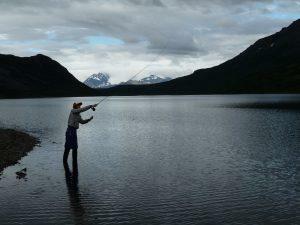 The summer of 2012, I decided to head north to fly fish in Alaska. In those three months, I drove almost the entire road system, from north of Coldfoot and south to Homer, with extended stops spent hiking and fishing. I was floored by the vast landscapes and wildness. I knew I would be back. In the Talkeetna Mountains. Photo by Nyssa Landres. Eventually, I saw the need to refocus from my seasonal lifestyle. I pursued graduate studies in environmental law and public administration at the University of Montana in 2014. During the summer after my second year, I interned at the Department of the Interior Solicitor’s Office in Anchorage, where I was introduced to issues surrounding Alaska Native communities and natural resources. These projects gave me a framework to appreciate the significance of Alaska’s lands and waters, particularly in light of the changing climate. 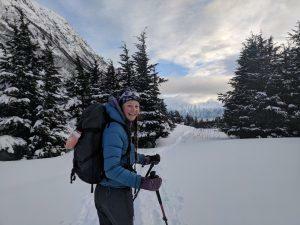 I returned to my last year of law school with a renewed resolve to protect Alaska’s most vital wild places. 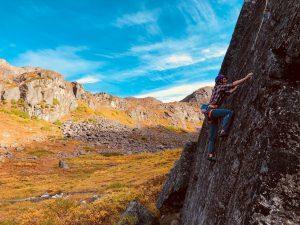 Climbing in Hatcher Pass. Photo by Alex Lee. I finally moved to Anchorage in 2017 and clerked for Judge Kari Kristiansen in Palmer, where I learned Alaska law and procedure. Now, I am thrilled to begin my legal career working to safeguard Alaska’s wild places as a legal fellow with Trustees for Alaska. I am delighted to be part of such an effective organization, and to receive mentorship from Trustees’ attorneys while advocating for Alaska’s lands, waters, and people. And, yes, as you probably guessed—I still spend weekends exploring mountains.